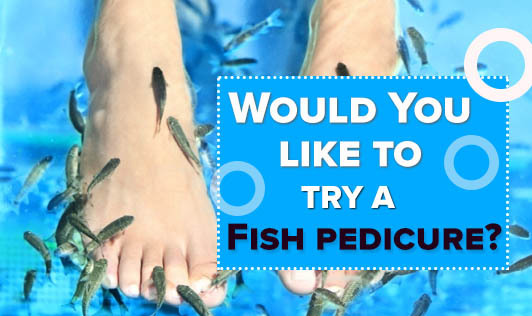 Would You like to Try a Fish pedicure? Improving the appearance of your feet and hands with a pedicure or a manicure is a very relaxing process. It's a way most of us pamper and de-stress ourselves. But, have you ever thought of the same process done by fishes? Yes, you heard me right; it's called ‘Fish pedicure' or ‘Fish manicure'. Garra rufa, is a kind of nibble fish also known as doctor fish which is used for fish pedicure or manicure. This practice originated in Turkey about 400 years back where these fishes were used for various healing processes. With the increasing demand in therapy, they are now exported to Asian countries. These fish survive in warm water and are toothless. They nibble away the dead skin of your feet or hands leaving them clean and soft thus aiding in growth of healthy skin. As they are toothless, they cannot bite on live skin and hence are safe. In a fish spa treatment, the foot or hand bath consists of about 70 to 100 fish in which the person is asked to immerse her feet or hand for 15 to 30 minutes. Most people have a ticklish feeling. Once the fish treatment is over, the regular pedicure or manicure continues leaving your skin rejuvenated and soft. On a cautious note, people with sores or open cuts and wounds, diabetics or anyone with AIDS or cancer are advised to avoid fish treatments. Make sure each spa has its own filtration system that cleans, refreshes and sanitizes the water regularly throughout the day. They work best on corns, callus heel cracks and other tough growth making them soft and supple. They prove to be of great benefit to people who are overweight, dancers, and athletes. These fish are known to heal psoriasis and eczema too. So, go pamper yourself with a fish treatment that makes your skin well hydrated, fresh and de-stressed. Rejuvenate in a new way!